Feby. 1st. Therm. 3 P.M. 63. Fine warm weather. Feby. 2d. Sunday. Went to the Bayou St. John to look for a passage to Mobile – were again disappointed. Shepherd Brown arrived and spent some time with us. Feby. 3rd. Fine weather. Went again to the Bayou and engaged a passage on board the schooner Rose in Bloom, Capt. Cadet. Mr. [Shepherd] Brown dined with us. Feby. 4th. Mild fine weather. Therm 60 at 12 o’clock. Dined with Mr. McDonough and Shepherd Brown Esq. Feby. 5th. Went to the Bayou [St. John] and put our baggage on board of the schooner. Rose in Bloom, Capt. Cadet. In the evening went down the Bayou part of the way to Fort St. John. Feby. 6th. In the morning arrived at the Fort. Went ahead carved our names on the light house. Cold damp weather. Hard rain from 11 o’clock P.M. until midnight. Feby. 7th. Thunder before day. The wind changes to N.W. ­­­Leave the Light House at 7 and have a fine run through the lake. Passed the Bay of St. Louis as sun set, [passed] Christiana, and anchor between the Main and Cat Island. Feby. 8th. Got underway before day. A fine clear morning passed Ship and Dog Islands. The mouth of the Pascagoula River and entered the Bay of Mobile. Come to anchor at 9 P.M.
Feby. 9th. Sunday. Clear warm weather. Wind light and ahead. Two gunboats in view. Rounded ____ toward Mobile. Was boarded by Lieut. Carter of the U.S. Navy near Dog River. About 4 o’clock arrive in the harbor [of Mobile]. Spanish colors flying. Were hailed from the fort and ordered to come to. The Commandant had walked out, so that we remained on board all night. Feby. 11th. Agreed to hire a boat in company with Mr. Lewis, Inspector of the Revenue, and proceed to Fort Stoddert. Drew a Bill on R.D. Shepherd, Esq. in favor of Mr. John Forbes and Co. for $300. Could not get off in the afternoon but changed our quarters to Mr. Morell’s. Therm. 67 at 3 o’clock. Feby. 12th. Proceeded up the river in a canoe or pirogue, rowed by 4 Negroes. A fresh in the river. The lands very low. No bluffs or banks for many miles, swamp on both sides [of the river]. Night came on before we arrived at a House 21 miles from Mobile. Feby. 13th. Set out again and after some trouble arrived at Fort Stoddert. No tavern or public house. Were hospitably received by Judge Toulmin. Rain at night. Feby. 14th. Were called on by Col. McKee, who conducted us to Headquarters, at Maj. Boyer’s, where we were treated with great politeness and hospitality. Rode out in the evening in quest of horses. Feby. 15th. Much rain at night with lightning and thunder. Purchased two horses at high prices. Bayou St. John in the City of New Orleans heads a short distance from the Mississippi River and drains northward to Lake Pontchartrain. Lake Pontchartrain, at sea level, connects with the Gulf of Mexico at a much shorter distance than the 100 miles down the Mississippi to its mouth in the Gulf. Passage was engaged to Mobile from which they would travel northward a few miles to Fort Stoddert a U.S Army base in the Mississippi Territory where their homeward trek by land would begin. Bedinger does not elaborate on the journal comment “after some trouble”. Feby. 16th. Sunday Rain in the morning. Prepare to travel North to R.D. Shepherd. Packed up Fowling piece in a small box which was left with the S[?] Mr. Spillman. Gave a letter to Mr. Burner. Were furnished with a memo of the Road by Capt. Arbuckle. Feby. 17th. Left the Cantonment about 10 A.M. Much difficulty in traveling. Crossed Tombigby River at Mr. Carson’s ferry. Much water on the Cut off 2. Swimming places and lay at a cornhouse on the Island. Feby. 18th. Crossed the Alibamy [Alabama River] and one swimming place to Mr. Mims’s [Fort Mims] Lay there the balance of the day. Feby. 19th. Entered the Wilderness and traveled to Bandons. Feby. 20th. Passed the Great and Little Escambia Rivers to Woolf camp. Feby. 21st. Limestone Runs, Murder Brook. Burnt Corn Spring to Polecat Run. Feby. 22d. Seashells. Large white oaks and other trees. Some prairies to Maenal’s [Samuel Moniac’s]. Feby. 23rd. Sunday. Some beautiful high prairies, four or five Creeks, three of them swimming. Pass Evans’ to Doyl’s [Doyle’s]. Rain at night. Feby. 24th. Breakfast at Colonel’s [James Cornell], a fine old Indian. Go out of the way to McQueen’s for corn at Tallassee. Dr. Foster misadventure. Encamp at Honeywood. Feby. 25th. Travel hard all day. In the morning pass Uchee creek then the Chatahoochee River to the Old Town of Cassita. Town house and friendly demeanor of the Indians. Encamp at the night 3 miles off. Feby. 26th. Move on steadily and encamp about sunset at Eclipse Creek. Feby. 27th. Arrive at Flint River about 3 P.M. Col. Hawkins. His gardens. Indians, Moravians, Yankee ______, etc., etc. Feby. 28th. To Oakmulgee [Ocmulgee]. Fort Hawkins, Capt. Booth and Lieut. Span., 31 miles. Feby. 29th. To Milledgeville, Baldwin Co.[Georgia], 29 miles. A. Elliot. Poor fare at Darnell’s tavern. Sunday March 1st. To Sparta, Hancock County [Georgia], 25 miles, where we resolve to stay a day to refurbish, shoe our horses, mend saddles etc., etc. March 2d. Write to Sundry friends and find very good fare at Mr. Abercrombie’s. March 3d. Passed by Powelton towards Washington [Georgia] to the House of Mr. Lucket. March 4th.. Pass Williamson’s Mill, Smyrna meeting house and Hanspisers[?] to Basil’s ferry on Savanna River. March 5th. Cross Little River. Met with an old Dutchman. Dine at Glover’s and lodge at the house of Col. Logan. March 6th. Crossed the Saluda River at Swansea ferry. Breakfast at Liggons’s and lodge at Dunklin’s. March 7th. Fall in with Mr. Chisholm. Pass Duncans Creek. The Inoree[Ennoree] and Tiger Rivers. Dine at Glens. Cross Head River [at] Fisk D___ ford and stop at Lewis’ on Sandy River. March 8th. Sunday. Exchange horses. Breakfast at Chesterville [now the town of Chester, South Carolina]. Cross South, Rocky and Main Forks of Fishing Creek to Mr. Reeves’, are there joined by Maj. Loving and Mr. Powell. Weather uncommonly warm. March 9th. Catawba River at the ferry above the Old Nation Ford. Charlotte Town [now Charlotte, North Carolina], having breakfast at Dinkin’s. Went 9 miles farther to Orr’s. Cold weather today. March 10th. Breakfast at Porter’s. Pass Salisbury to Long’s. March 11th. Longs Ferry [on the Yadkin River? ], Reed’s to Salem [North Carolina]. March 12th. Rest at Salem and visit the church, etc. March 13th. Germantown the seat of justice for Stokes County. Davis’ ford on Dan River to Leale’s[?]. March 14th. Enter Virginia, Henry County. Cross Mayos River (two branches) to Stiple’s. Smiths River, Mr. Barksdale’s to David Gates’[?]. March 15th. Sunday. Standifer’s, Pig River, Blackwater, Calloway, Boons Mills, Pinnack’s near Maggothy gap [Maggoty Gap] to McClenehan’s. March 16th. Crossed Roansak, Tates Mill, Big Lick [now Roanoke, Virginia], Coffman’s, Amsterdam, Greenville, Beals bridge, cross James River to Pattonsburg. March 17th. Springfield, Natural Bridge, Lexington, North branch of James River to Kenair’s. March 18th. Steel’s, Greenville, Staunton. March 19th. In the afternoon crossed a branch of Shenandoah River and went 9 miles to Roland’s. March 20th. Rain. Crossed north branch of Shenandoah River went 15 miles to Harrisonburg. March 21st. Rain. After breakfast, set out. Dined at New Market. Cross Shenandoah River near Pollack’s. March 22d. Sunday. Roads bad. Woodstock (Fravell’s), Storm Town[?]. Cedar Creek to Newtown. March 23d. Winchester (Robertsons Tavern) Stone House to Mr. Washington’s. March 24th Arrived at home [Bedford near Shepherdstown] about 12 O’clock. The statement, “Prepare to travel North to R. D. Shepherd”, implies that Shepherd was at Fort Stoddert, but there is no further mention of Shepherd in the journal. Polecat Springs along an Indian path that connected the Lower and Upper Creek Nations and was identified by migration legends as a stopping place. 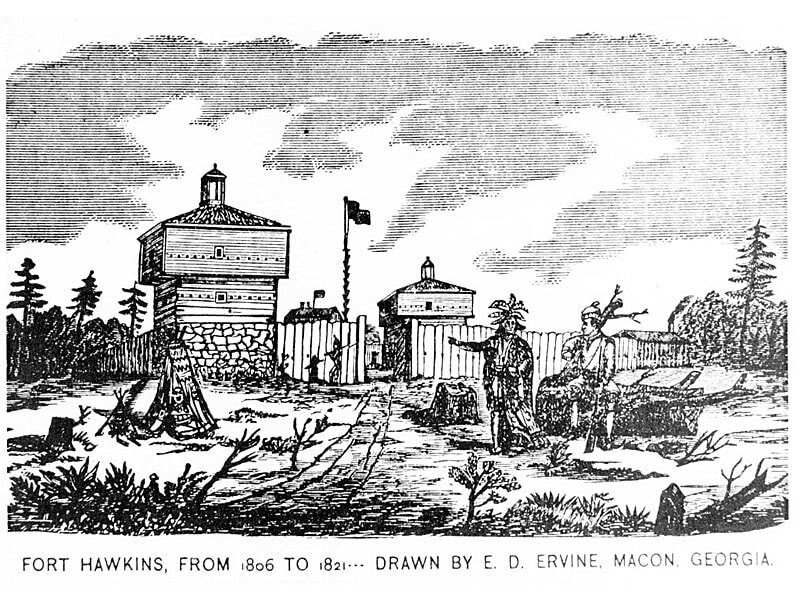 The U. S. Army's Fort Hawkins at present-day Macon, Georgia was established in 1806 by President Thomas Jefferson and named in honor of Col. Benjamin Hawkins. [http://forthawkins.com/] The fort was used as a staging area for American troops by General Andrew Jackson before the Battle of New Orleans 1814-1815. Crossed the Savannah River at Basil's Ferry from Georgia into South Carolina. Now back in settled country, Daniel Bedinger and Dr. Foster were traveling on better established roads and found more accommodating quarters and better fare at homes and taverns along their route. They now are afforded ferries to cross the larger streams. Before crossing into North Carolina, Daniel Bedinger passed close to the site of the Revolutionary Battle of Cowpens. He doesn't indicate in his journal if he visited the place.where he served as a rifleman under General Daniel Morgan. "Maggoty Gap" describes a natural gateway of the Great Wagon Road that made it possible for wagons and livestock traffic to pass through the Blue Ridge Mountains at Roanoke, Virginia. It carried enormous amounts of traffic in the late 18th century and much of the 19th century until a railroad was extended over the ridge in 1892. Through Maggoty Gap the travelers entered the section of Virginia called the Great Valley. Bounded by North Mountain on the northwest, and the Blue Ridge on the southeast, it extends across the state from the Potomac to the southern line, nearly two hundred and fifty miles in length and varying from twenty to forty miles in breadth. Mr. Washington was John T. A. Washington, Daniel Bedinger's son-in-law, husband of his daughter Elizabeth Conrad Bedinger. Arriving at Bedford on March 24th having ridden from Fort Stoddert on horseback some 36 days in frequently inclement weather, fording rivers, slogging through swamps and marshes, one might wonder if Daniel thought his journey was truly a journey to improve his health. His journal betrays no hint of discouragement, no word of physical problems or discomfort caused by the inconveniences and hardships of the journey. At “Bedford” Daniel was greeted by his wife Sarah and met his infant son, Henry, seven weeks old. Daniel’s young son Henry was barely six years of age when Daniel died at the age of 57 years. Henry would grow to be a physically strong and an intellectually brilliant man, having inherited many of the finest qualities and attributes of his father. He was elected as a representative to the U. S. Congress and served as the first American ambassador to Denmark. Tragically, he was overcome by death at an untimely early age as his father had been. [ii] The jurisdictions of the territories bordering the southern Atlantic and Gulf Coast had been in dispute since New Word discovery by the European powers, Spain, France and Great Britain. The recent Louisiana Purchase had taken France out of contention, but Spain still occupied Florida and the strip bordering the Gulf called West Florida from Pensacola to the Mississippi River. All three countries had historically enlisted and supported the Native American Indians in resisting the westward expansion of American settlements. The British and also the French were brazenly interfering with American shipping and impressing American seamen. The Spanish at Pensacola and Mobile were actively trading with the Indians, supplying them with guns and munitions in return for deer pelts and other goods. The Indians, notably the northern Creeks, called Red Sticks, were deeply resentful of the American intrusion into their territory by the establishment of the postal horse path and and were willing accomplices of the Spanish. The Indians had interfered with postal riders, stolen mail and delivered it to the Spanish in Pensacola. [iii] James Innerarity and his brother John, were partners in John Forbes & Co., the successor of Leslie, Panton & Co., a Scottish company which had originally begun trading operations from the Atlantic seaboard in Georgia and South Carolina. During the American Revolution, Leslie, Panton Co. rather than pledge allegiance to the revolutionary cause, moved their base of operations to St. Augustine and after the war to Pensacola in Spanish West Florida. The partners were all Scotsmen who had traded with the colonists and Indians of South Carolina, Georgia, and East Florida before and during the American Revolution. It was a matter of survival for them to remain loyal to the Kingdom of Great Britain, as most of their trade goods, especially guns, lead, and gunpowder, came from the mother country, and rebelling against the British would have cut off those supplies. The Spanish not having trading connections with the Indians, allowed the company to operate from West Florida. For many years the company dominated trade with the Creeks and Seminoles. The company was a major buyer from the Indians of hogs and cattle: either live on the hoof, as smoked or salted meat, or as skins. It also purchased indigo plants, hides, furs, corn, cattle, tallow, pitch, tar, hickory nut oil, tobacco, honey, myrtle wax, salted wild beef, sassafras, canes and truck produce in exchange for weapons, gunpowder, tools, cloths, dyes, liquor, and various trinkets. The partners harbored a great antipathy to the United States, and used their influence with the Indians to advance Spanish territorial claims against the United States, and to encourage the Indians to resist white settlers and the United States' attempts to acquire land from the tribes. Their antipathy towards the U. S. contributed to the hostility exhibited by the Redstick Creeks to travelers through the Indian territories and American settlers. [iv] Daniel Bedinger and Doctor Foster had two main alternatives as to the route they could have taken back from Fort Stoddert to Shepherdstown. One, would take them on an overland route route northward to the Natchez Trace, following the Natchez Trace to Nashville, thence eastward through Tennessee and possibly Kentucky to the Great Valley Road in Virginia. The other route would be to take the Federal Road, a road improved by the military which followed the postal horse path from Fort Stoddert, north of Mobile, through the Mississippi Indian Territory across what is now Alabama and through Georgia. The route would then go northward joining the Great Valley Road in South Carolina, through North Carolina and into Virginia. The Great Valley Road, there turned northwestward, through the Blue Ridge Mountains at Maggoty Gap, thence northeastward to the Shenandoah Valley and to Shepherdstown. 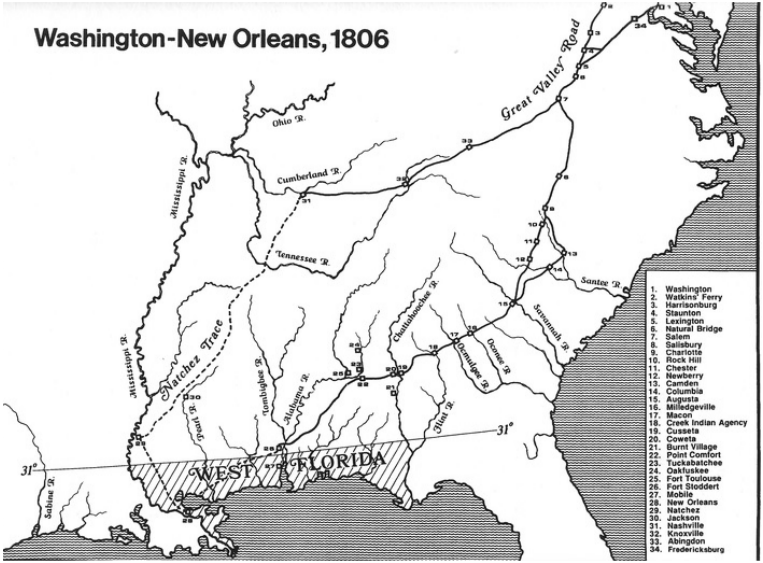 Routes from New Orleans to Washington in 1806. From Southerland and Brown, 1989, p.11. [v] The fowling piece, a shot gun, would have been used during the journey to shoot wild birds which were plentiful and would have provided variety in their menu along the Mississippi River and in the Gulf area. A long scatter gun would have been unwieldy and not useful as a weapon of defense to warrant carrying by horseback on the trip home. [vi] The “memo of the road” furnished by Capt. Arbuckle would have shown the route of the Federal Road, the best places to ford streams, outposts and the few settlers’ habitations; information that was vitally important to the travelers. Capt. Arbuckle had been in charge of the military improvements of the Federal Road and would have known the road in detail. Before 1811, the Federal Road, across the Mississippi-Alabama Territory was nothing more than a horse path that had been marked by the government as a postal route. The government improvements called for widening the roadway to sixteen feet, building causeways across swamps and laying logs across large rivers to facilitate the movement of troops that would be needed in anticipation of defending New Orleans from an assault by the British. [vii] “Much difficulty traveling” is an understatement judging from the swampy nature of the terrain. Leaving Fort Stoddert, Bedinger and the Doctor were obliged to ford, swim and wade through miles of swamp land of the Tombigbee and Alabama Rivers and distributary channels. The first night they found shelter in a shed used for holding corn. [viii] The spelling “Alibamy”, a colloquial term for the Alabama River, is perhaps derived from "Alibamons", the name given the river by early French explorers of the area. Ref: Adam, 1824, quoted in Christopher and Waselkov, 2012. [ix] Fort Mims was built by Samuel Mims on the east bank of the Alabama River where he operated a ferry. The fort was a plantation house palisaded by to protect settlers and travelers on the Federal Road. Although the commander of the fort, Daniel Beasley, had been warned that an attack by a large body of Red Sticks was anticipated, the commander discounted the warning and the fort was poorly prepared. On of August 30, 1813, the Indians attacked at noon. Sand interfered with closing the main gate, and the Indians entered before it could be closed. The Creeks by mid-afternoon had massacred the defenders. A burial party sent to Fort Mims three weeks later found the bodies of Samuel Mims and his brother, among the 247 men, women and children, who had sought safety in the fort. It is estimated that 20 to 40 whites escaped . The bodies of 100 warriors were also found. Ref: Southerland and Brown (1989, p. 40). Samuel Mims was of the Mims family from which the Showalters (ancestors of 6th generation Bedingers) are descended through the Easterling, Giles, and Harrison line. [x] Upon entering the wilderness our travelers were well aware of the obstacles and dangers that lay ahead through the Indian territory on the Federal Road. The road had in theory been "improved" by the army to serve as a route for mail and the movement of troops. Causeways were built through the swamps , built of logs laid across the roadway and sometimes covered with dirt. Logs were felled across streams and crude bridges were built. The Indians were encouraged to operate ferries across larger streams. At some stream canoes were available for crossing while horses and stock swim across. Lacking any of the previous amenities, Daniel Bedinger records that many streams were crossed by swimming. The opening of the road enticed many families and adventurers to travel the road to New Orleans and the new frontier along and west of the Mississippi River. 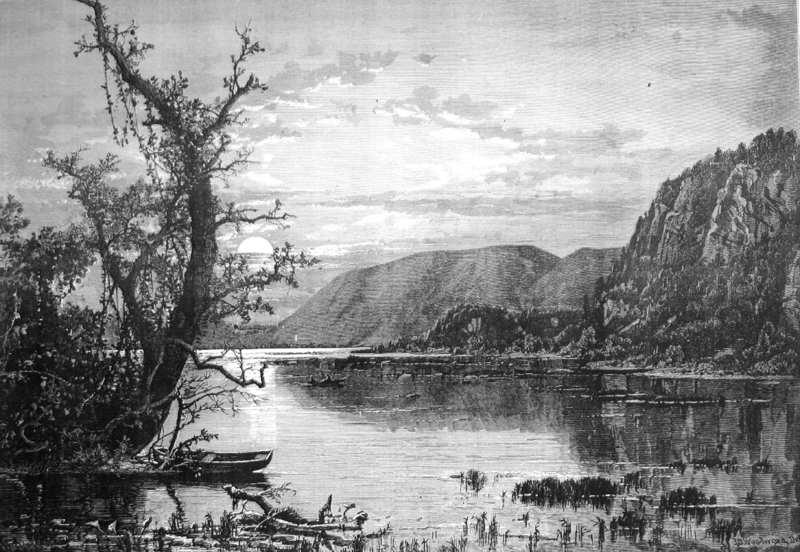 The difficulties and hardships of settlers moving through Indian Territory is told in graphic detail, including the necessity to ford and swim large streams, the difficulty of traveling trough miles of swampy ground, and the scarcity of outposts, settled homes, and taverns, where supplies and accommodations might be obtained. Ref's:Benton, 1998; Southerland and Brown, 1989; and Christopher and Waselkov, 2012. [xii] The name "Maenals" is very likely intended to be the name "Moniac". The name has been variously written and pronounced as Manack, Mannac, Macnac, McNac, Menawa, Mcrae, and Mr. Nal. These variations are largely found in the writings of Benjamin Hawkins [see footnote [xiv] below.] Most of the proper names in Bedinger's journal are phonetic spellings from conversations between the travelers and people they met. Many or most of the settlers were illiterate and used various pronunciations of proper names (Christopher and Waselkov, 2012). ﻿[xiii] ﻿ Colonel, “a fine old Indian”, is with little doubt James Cornell, a wealthy Creek metis, a mixed Indian and French-Canadian according to Christopher and Waselokov ( 2012). Cornell had his main plantation at Burnt Corn Spring which Bedinger and Dr. Foster passed on February 21 and he also had a cabin near Fort Comfort, where we presume they met James Cornell, whom he refers to as “ a fine old Indian”. Cornell, during the Creek War of 1813-14, sided with Gen. Jackson and the U. S. forces against the Red Stick Creeks. The spelling of "Moniac" and "Cornell" exemplifies two challenges facing researchers studying the early history of the Creek Indians and their relations with Americans: (1) historical inconsistencies in the spelling of personal and place names make it difficult to identify people and places accurately; and (2) handwriting of that era is difficult to decipher. Only after reading all of Benjamin Hawkins’s published correspondence between 1805 and 1814 did it become clear that Hawkins’ editor, C. L. Grant, repeatedly misunderstood the various ways Hawkins wrote Samuel Moniac’s name. Moniac, who was non-literate, evidently contributed to the confusion himself by pronouncing his name Manack (even though his father and his son used the traditional Dutch form, Moniac). In any case, Hawkins transcribed what he heard as Manack, Mannack, Macnac, and McNac (see Christopher and Waselokov, 2012). [xiv] Col. Benjamin Hawkins was the Indian agent stationed at his home on the Flint River in Georgia. He had been appointed by his friend George Washington in 1796 as General Superintendent of Indians Affairs dealing with all tribes south of he Ohio River. His manner was a fair and progressive in dealing with the Indians and worked to preserve peace and to educate and encourage the Indians to adopt American and European agricultural practices. Much of his work was destroyed by the Creek War of 1813-14. Benton, Jeffrey C, 1998, The Very Worst Road, University of Alabama Press,Tuscaloosa, 157 p.
Christopher, Raven M. and Waselkov, Gregory A., 2012, Archaeological Survey of the Old Federal Road in Alabama, Alabama Dept. of Transportation, Montgomery, AL, 291 p.
Adam, Hodgson, 1824, Letters from North America, two volumes, London:Hurst, Robinson & Co.
Southerland, Henry deLeon Jr, and Brown, Jerry Elijah, 1989, The Federal Road through Georgia, the Creek nation, and Alabama, 1806-1836, University of Alabama Press, Tuscaloosa, 198 p.
Natural Bridge, Virginia. Strother, David Hunter, 1959, The Old South Illustrated, The University of North Carolina Press, Chapel Hill, 295 p.
Map of the Lake Pontchartrain Basin, Greater New Orleans, "Isle of Orleans" area.1880 US publication; public domain for expired copyright. 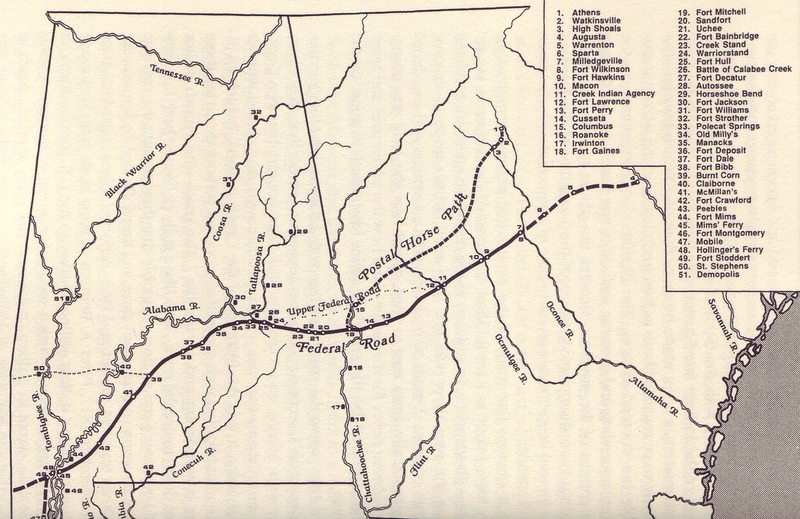 The Federal Road, from Southerland, Henry DeLeon Jr., and Brown, Jerry Elijah, 1989, The Federal Road through Georgeia, the Creek Nation, and Alabama, 1806-1836, Maps by Charles Jefferson Hiers, The University of Alabama Press, Tuscaloosa, 198 pp.​, p. 70. 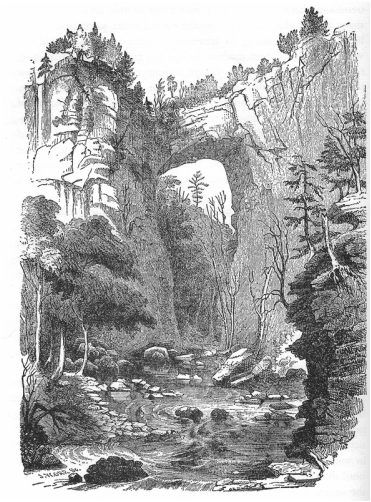 Natural Bridge, Virginia, from Strother, David Hunter (Porte Crayon), the Old South Illustrated, edited by Cecil D. Eby, University of North Carolina Press, Chapel Hill, 296 pp., p. 74.